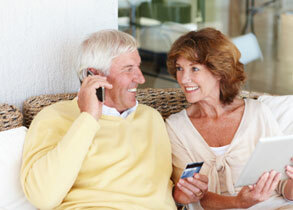 We have provided telephone banking to community banks since 1994. Interfaces are available for all major core vendors in both in-house and hosted environments. Industry-standard inquiry, funds transfer, merchant check verification, and other functions are provided. Security and confidentiality are prime concerns. We comply with all banking acts and regulations and FDIC mandates. All equipment and software are provided; and no equipment purchase is required. Our ratio of technicians to customers is the best in the industry. We are happy to provide you with references for our immediate response, top notch service. Under the same single ownership for the past 40 years, we give you the stability of a proven voice response product and service team with the guaranteed lowest prices in the industry. Find out why we are the preferred telephone banking provider for several core vendors and how inexpensive it is to switch services and upgrade with us. Please call us at 1-800-944-2797 to discuss your needs. There will be no fees and no obligation on your part unless and until you are completely satisfied with our telephone banking services.